Every time I watch one of Chris Cozen’s videos on Artist’s Network TV, it’s not long before paint starts splashing over here. Happy June Sunday to all! I hope you either make something beautiful or make someone feel beautiful today. Peace. < A Friend for Life (in Between): 100 Face Challenge #63! This is neat. I wonder if a curvy organic line over this wonderful foundation would work. Maybe even a bird??? Sometimes, it’s just fun to play with colors and push their limits…doesn’t have to be anything, right? 🙂 I think this evokes something glamorous and romantic! Thanks, Teresa! You’re right! I just would like it to have more balance or feel more unified. The photo in this case really doesn’t show it accurately, it has more light than pictured. It definitely feels like it wants to be something though. Can’t explain, it just has that feeling about it. Not necessarily representational though…in fact, probably not. But just more together, I think. Thanks for your feedback! I hope you’re having a great weekend! Black gesso….hmmmmm….my mind is swirling. Future experiments for me. I like the dark. The colors are comforting. Thanks, Dawn. Have you ever worked on black gesso? These colors do seem to call your name – maybe you’re influencing me! I do love your colors! Thanks. The colors are definitely calling my name. Color my world! I am a gesso newbie. I just started using white last week but I really appreciate extra coats of gesso on my canvas. Apparently there are lots of different colors of gesso, and of course gesso can be tinted too. Something else I’d like to try, with white gesso. I love experimenting! Yeah these colors seem right up your street, Dawn. I need to read about gesso. Tinting it sounds fun. Right? I have learned so much from Chris Cozen. I know she is acrylics and you are oils, but … Artist’s Network tv is IMO a bargain at $19.95 per month. The black gesso really makes for a unique look. The colors seem to glow in places. To me it’s an apartment building, lights in the windows, lots of diversity among the people who live there. Thanks, Judith, that’s kind of what I’m seeing too. This one has been through many incantations. I just couldn’t put it down last night then picked it up first thing in the am. It’s interesting how some paintings or drawings just “speak” to us. Ok and the glow comes from Golden’s interference and metallic paints. Little bits here and there and mostly layered over but still the light shines through. Golden’s paints seem to glow from within. This is why I love them! Oh, thanks for the info! I’m still using my “cheap-o” acrylics. I’ve seen metallic paints and I love them. More for my “want” list. And that list is never ending, I know, but seriously. Golden paints. When you’re ready to really go for it. My .02 anyway, but if you like the glowing then definitely. Definitely like the glowing effect. After I’ve had a few more lessons with acrylics, I’ll check out what Blick’s got. Your work deserves the best, Judith. Happy to help. Thanks for your encouragement! I really appreciate that. I do love the richness of the underpainting. A fun new avenue to explore. Laura, I can feel the energy of this piece, and it reminds me of windows in New York at nighttime. Thanks, Carol, me too! Really glad you like it! Thanks for your feedback. Margaret you made me LOL this morning. Yes, I need your address so I will know where to go whenever I need my little ego all up and happy! So glad to get your warm feedback on this piece! You know how to make a girl smile, my friend! Laura, this is my favorite so far. The color, light and depth you achieved by using the black gesso is stunning. It looks as though The light is shining through glass. Keep up your painting and experimenting. It is a joy to see your results. Happy day today! you covered up the elephant?! I pretty much loved that – but I love this toooooooo! and I think you totally achieved depth and light in the GORGEOUS SWOON-worthy piece! It is so so beautiful – and guess what? You did both today… made something beautiful and made someone feel beautiful – me – with your sweet comment on my post. You can just kick back and chill for the rest of the day now beautiful Loo! I will do that. Thanks, Ann! This is powerful stuff – the colours are amazing and it’s held together beautifully by the suggestion of a grid. Thanks so much, Michael! It’s amazing how the deep black underneath transforms the colors up above. So glad you like this! I appreciate your feedback. England is on my bucket list – I would love to meet you someday! It’s really easy to encourage someone who is functioning in her gift! Powerful piece of art Laura, with the soft feel and strong contrasts – great choice of colors. Great colours and the textures. Thanks so much! I love playing with color. So much fun! Laura!! this is lovely! the black is great and there is light! I really like the violet in there with the hint of (cobalt teal) as well to give it a low light glimmer of color as if at night. wonder if you could repost it, as a vertical? It reminds me of an abstract of city lights on a rainy evening. Laura, this is very cool. Thank you, Connie! My mission is to keep posting artwork that is very cool. We shall see! One never knows where these abstracts will go. It’s almost like quilting with a paintbrush. Really enjoying it! I always learn something new from you. Never even heard of black gesso! Thanks, Kerfe. I will look him up again; my memory is not good but I know I have looked at his work. I really appreciate the compliment very much! Have a good week. I need to study his work. Thank you for pointing me to him. I posted another this morning in a similar vein. And hope to post another soon. These abstracts are rocking my world. And acrylics. I may try and do some Klee-inspired work. Thanks again, Kerfe. thank you!. i’m glad you appreciate how i think. most times my ideas are a little crazy and very few understand me. Beautiful piece! You created a lot of depth with the black gesso. Beautiful and interesting colour combinations. Mysterious and exotic :-). Makes me think of one of those little hillside towns in Italy at night – a view through a small window, so one can only see a portion of the hillside. I wonder how you will see it after not looking at it for a while. I guess that is what artists mean by “fresh eyes”… after a bit of distance, the artist can see a piece more from a viewer’s perspective. One of the fun things about abstracts is that different people see different things. I was surprised by how quickly I reacted to this painting of yours. Usually I have to stare at abstracts for a while to get a feeling. Wow, that’s really good to know, Myriam, thanks! I’m starting to get into an abstract groove, I think. Really enjoying them. I’ll be curious how it appears to me in awhile too. Have you ever wanted to experiment with abstracts? Your abstract experiments have definitely got me thinking about creating abstracts too. It is a neat way to play with shapes and patterns and learn about (experiment with) different media. I’ll probably start with deconstructing real objects though. But I think that is all considered figurative. I’m working on painting my second bird with watercolours and I am having as much fun with my paint testing paper as my bird painting. Watercolours are so alien to me and it is so cool to find out how they mix, separate and react on paper… and then there are the different brushes, sponges, sticks, etc. Thanks so much for sharing your experiments… they inspire me and give me courage. Aw, that’s awesome! I’m glad to hear that. I’m not really an adventurous person but I do enjoy being bold with art. Watercolors are lots of fun to learn and play with too. Sounds like a fun time at your place! Another yummy palette! i like the suggestion of the organic line added to it! Thanks! I may just do a whole other painting like that. Not sure I want to add anything to this one just yet. I am loving these colors. Really preferring painting a quilt to actually sewing one, Tierney. My machine and I have a hate-hate relationship, lol. Wow Laura, your work is awesome! Thanks, Luke! That’s a pretty amazing statement coming from you! Trying to develop some depth and texture in my abstract work. Can’t hold a candle to yours though. Especially considering this is 5×7″. Hehe. I’m trying to work up to larger. I really appreciate your comment. Have a great weekend! 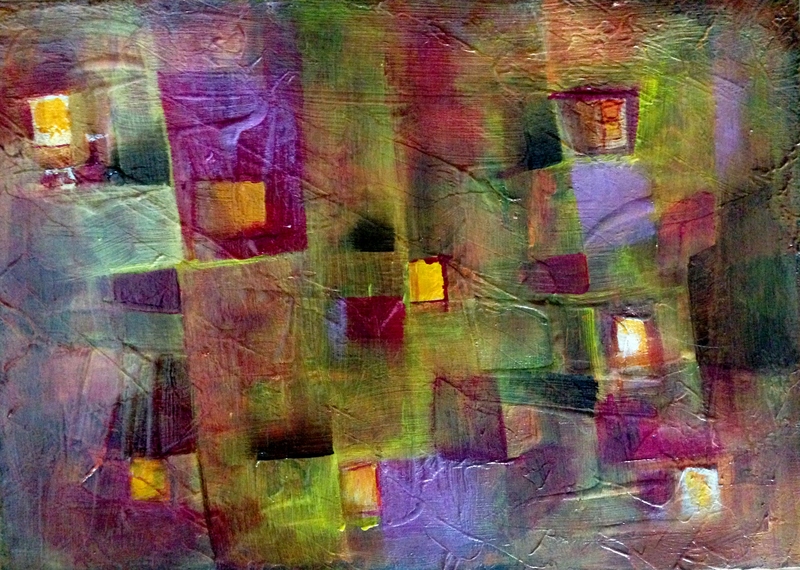 Love these experiment with gold acrylic paint…they just glow..how fun! Thanks, Marlene! I am just feeling my way with acrylics, but really preferring them to watercolor at this point. Glad you enjoyed and thanks for visiting!